Z and I seem to have accidentally taken the day off. She is watching Toy Story 3 for what I believe is the 1,000,000th time, and I haven't even glanced at my to-do list. Oh well, right? 01. The Color Pallet: The large strip of color across the top of the board is the color of our walls right now. It seems much lighter in real life and I actually kind of love it. I never would have guessed I would like it if I were just looking at a paint chip, but the first morning I woke up in our new room I decided I loved the walls. Lucky for us, I found a couple of gallons of that color paint in the basement, so we can touch up the walls with a new coat of paint for free. Yipee! 02. We need bedside tables. I'm thinking about the Lack table from Ikea (hello, $9.99, I love you) because I like the simple lines, but I'm keeping my eyes peeled at the thrift shops too. 03. We already have this rug from Ikea. 04. I know I want white bedding, I just have to decide exactly which white bedding. I would love to make this, but I'm worried I would never finish it. 05. We're going to make a headboard. I haven't decided exactly what fabric I want yet, but I know I want something with a nice pattern and a few contrasting colors. 06. I plan on incorporating more color with the bedside lamps. We have a couple of lamps we're not using that I think I can repaint, once again, using what we have. 07. I'm tossing around the idea of making a bed skirt out of this fabric. Do you think I'm crazy? 08. We have a huge clothes storage space problem. I'm thinking about repainting our old dresser a crisp white but I'm kind of on the fence about it. I wish we could afford a bigger dresser or armoire but I don't think that's going to happen any time soon. 09. These curtains are from Urban Outfitters. They are the only thing that I've actually purchased for the room. They haven't arrived yet but I'm really hoping that I love them in real life as much as I love them online. I'm hoping that they help tie the room together. 10. Last but not least, the antlers. After seeing this and this I became a girl obsessed. Lucky for me, I live in Idaho. My dad had a few sets of antlers that I'm pretty sure I can have. For free. Woot! Okay so what do you think? I'm dying to hear your suggestions, ideas, and thoughts. Also a little scared that you're going to hate it. Please do speak up! Also, it looks like the weekly menu will be the new Friday Feature around here. I'm so excited. I was secretly hoping you would choose that one. That will start up next Friday and I already have an awesome dessert in mind. I'm really loving yellow and gray together, so I think the stripey bedskirt fabric next to the gray flowered carpet will look fantastic. Do it. Also: love the blue on the lamp. 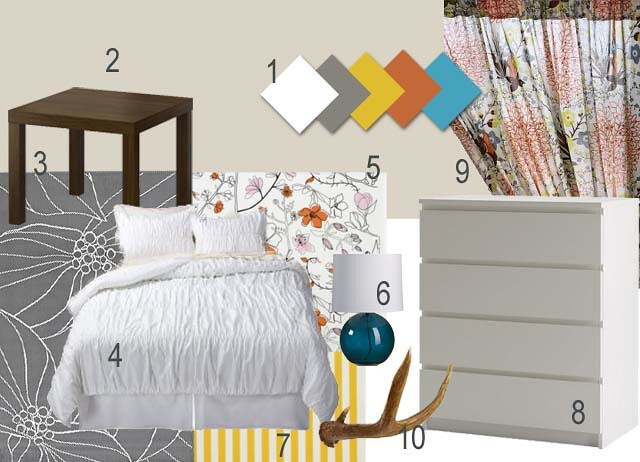 I love the pops of colour that you will add and I too would love to see that yellow striped bed skirt!! Oh you have to make it Miranda! first of all im a neewbie here and love you already! im still waiting for trim in our bedroom too:) aww thanks, your making me feel better about myself already. so i love all of it, well except the antlers and maybe that is because a friend of mine hangs every pair that he has in his livingroom. i just dont likey:) but im sure one pair will look nice and tasteful. love the stripes for a bedskirt and yes paint the dresser! good luck and can't wait to see further projects. Okay. I love the curtains. Love em. I totally think you should re-finish your dresser, as long as it is well built enough to last. I have done this with my own and it turned out awesome. But took me for-ev-er to finish. I think the striped bed skirt, has possibilities....it may depend on how the curtains look in real life. I like the antlers, and I have absolute confidence that you can accomplish the look you are going for. Love the grayish wall color, and the rug. I'm pretty sure that mood board is 'shopped. I can tell from some of the pixels and because I've seen quite a few 'shops in my days. I love everything! And hats off to you for picking one room to decorate. I tend to decorate here and there sporadically so nothing ever really gets done very well. love the colors, love the curtains and the idea of a white dresser. looks like a great room! good luck! that is awesome we have sibling side tables! I can't wait to see your master finished...motivation to get on mine. Yay! I love it Miranda! And I would actually say- stalk CL for a malm dresser. I'm all for re-finishing but you could probably sell the dresser you've got on CL and get a Malm for the same price. And save your painting energy for something else! Albeit the malm dressers are far inferior in quality. Just a thought. We outfitted all of our bedrooms with Malm dressers off of CL and I love them. They have great, simple lines. 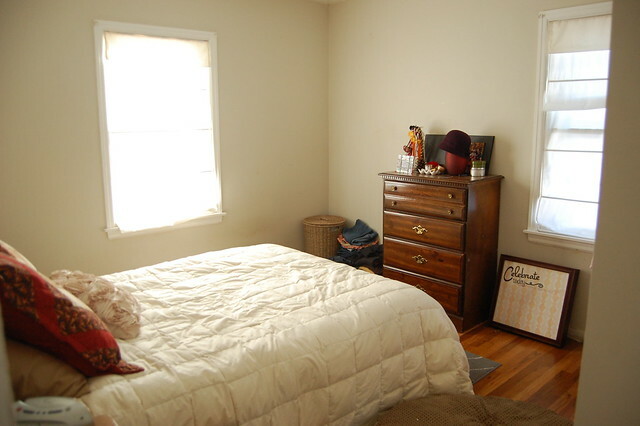 I really want to re-do my bedroom too, but we're so limited by not being able to paint! UGH! SO, I'm catching up on my blog-reading and I have some thoughts for you, having just redone my own bedroom! First, I agree that CL is a great place to find dressers, but you should also go to your local thrift/salvation army store. You can often find solid wood pieces there for cheaper than CL and they're way more durable than Ikea. Just give 'em a coat of white paint, some cute knobs from Anthro, and wah-lah! Gorge. In fact!!! Are you okay painting the dresser you have? For white bedding, look at places like Ross and TJ Maxx. Also, Crate&Barrel is having a white sale today. We have the Peninsula bedding on our bed and I LOVE it. Last but not least, you could totally make some artwork for hanging over your bed. Paint and a big canvas are cheap and you could get all crafty. Good luck! Oh, and I LOVE the bed skirt fabric. Love. I'm going to give you a tip for a resale site you may not have tried: ksl classifieds. It's like CL, but it has photos and is much more use friendly. I've seen some things in Idaho, but if you find something further south I know someone who would be happy to do a pick up & delivery in exchange for a nice lunch at Chez Miranda... Just saying. Besides, G has been asking about Z and would love to see her again. Sorry - go to www.ksl.com. Select the "classifieds" link on the rightish side of the menu bar. Dang - I'll try to conglomerate my thoughts next time. I'm also thinking you could incorporate your dresser with a built-in on that wall next to the window. Could be fab and would provide additional storage/decorating space. 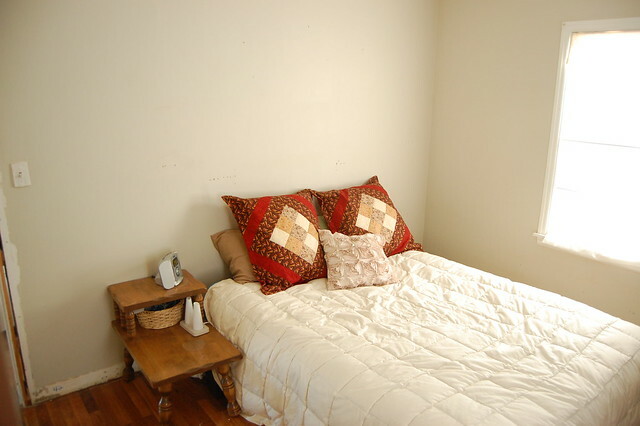 Keep in mind a dark wall in a small room will make it look smaller. If you choose a bright color as an accent wall and use a large mirror on on of the walls it will make the space look bigger. Goodwill often has funky old mirrors. Love the gray walls and the white bedding combo! 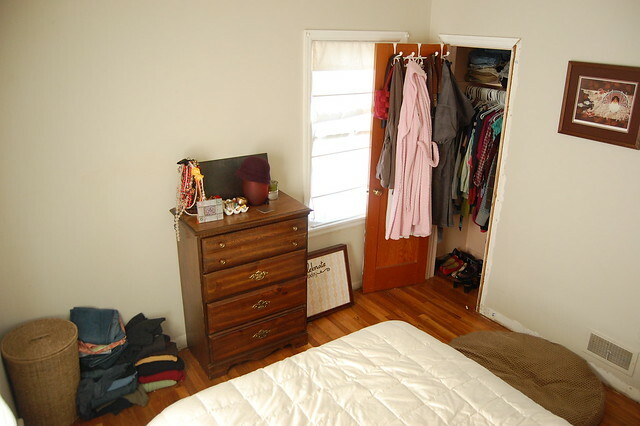 That really is a tiny closet! You've got your work cut out for you storage-wise. I love painted furniture. So much. And gray and yellow is pretty much my favorite combination right now.